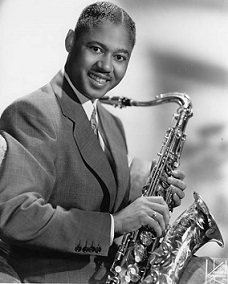 One of a handful of saxophonists who’d first gained recognition as a jazz musician in the early 1940’s and later successfully parlayed that to becoming a legitimate rock hit-maker which over time came to define him. Born in Orlando, Florida in 1922, Mitchell became proficient on piano before his family moved to New York when he was 13 where he took up the saxophone and clarinet, focusing on the sax when he began his professional career after graduating. In January 1941 he cut his first sides as a member of Benny Carter’s acclaimed band and soon jumped to Fletcher Henderson’s equally prestigious group. In time he’d work with two of the most renown trumpeters in jazz in Louis Armstrong and Hot Lips Page, but for the better part of four years he worked primarily with the comparatively lesser known Ovie Alston’s band. In 1949 he was singed to newly founded Derby Records as a solo artist as well as given the reins of putting together a studio band to back the rest of the label’s roster of artists in his capacity as musical director for the company, a position he for three years during which time he scored two Top Ten hits under his own name. Though that was all he registered in terms of charted records Mitchell released notable sides on numerous labels for the remainder of the 1950’s and played in Europe on the first overseas rock tour with LaVern Baker in 1953. However his greatest contributions now came as a session musician and bandleader for multi-artist rock shows held by Alan Freed. 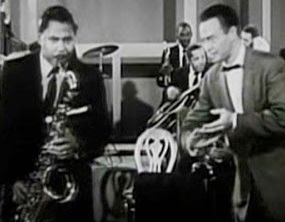 Mitchell had previously recorded “Moondog Boogie” named in honor of the disc jockey and the two of them appeared together in the 1956 film Rock, Rock, Rock. By the 1960’s the music scene had changed and with less focus on the saxophone in rock along with more self-contained bands lessening the need for studio musicians Mitchell drifted out of music, driving a taxicab in New York and playing only select dates around the city. A shy, self-effacing man off-stage in contrast to his larger than life persona in the spotlight Mitchell was one of the longest surviving veterans of the 1940’s rock scene, passing away in 2010 at the age of 92. As sideman… behind Doc Pomus.